All roads lead to the ancient city of Ile-Ife believed to be the ancestral of Yoruba people as the Arole Oduduwa and Ooni of Ife, Ooni Adeyeye Enitan Ogunwusi will on Friday 30th November 2018 play host to about 30 famous and upcoming artists from all over Nigeria expected to perform at the maiden edition of the THROWBACK CONCERT slated to hold at the prestigious Ife Grand Resort Leisure situated along Ibadan road, Ile-Ife from 9pm till dawn. Adex Artquake, the Throwback Concert's Project Director said the first of its kind event is in fulfillment of the Youth-oriented developmental agenda of Ooni Ogunwusi, using entertainment as a veritable tool in bringing the Nigerian youths together as a force too strong to be ignored in the affairs on the country. "This is undoubtedly the most newsmaking king in Nigeria today who is well loved by the youths irrespective of ethnicity and religion. 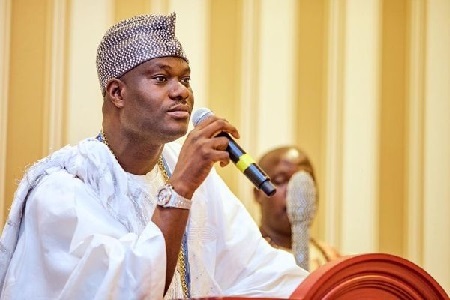 In the last three years of his reign as the Ooni of Ife, His Majesty has tirelessly identified with the youths of Africa to whom he had dedicated his monarchy. Throwback Concert is an entertainment initiative conceptualized to annually bring the youths together at Ile-Ife in fulfillment of Kabiyesi's Youth Development Agenda which he has been pursuing with vigour". The popular Atlanta and Labule crooner described the African foremost monarch as the new face of the African youths advancement, saying the Co-Chairman of the National Council of Traditional Rulers of Nigeria must be appreciated for his numerous youth development programmes not only in Nigeria but also across the continent of Africa.